Day T H R E E started off very similar as day two...RAINY! So, James and I headed downstairs to grab breakfast at Grits & Grind. At breakfast, we brainstormed ideas of what to do on another rainy beach day...our conclusion? Drive to the store, buy an umbrella, and get our bums on the beach! By the time we bought our 12$ umbrella, the sun was peeking through! We raced to the beach, with the umbrella. On our way, we dodged beach security because they still had James' metal shovel, and frankly he didn't want to lug it back so we just never went to pick it up. We set up camp on the beach and took a deep breath. SUNSHINE! My sister and her NEW husband were on their honeymoon, so we met up with them for a late lunch at La Cocina. There's something about Mexican food at the beach, it's so satisfying! At lunch we swapped stories of the week and the boys realized they finally had someone to participate in "activities" with, on the beach. We ended up down on the field at Rosemary Beach. I am pretty sure it was the highlight of our husbands' trip. They threw the frisbee for quite some time, while Kristen and I compared our cheetah skin (as our spray tans were fading from her wedding). James and I scored a couple more sunny hours at the beach and then headed out to Seaside for more good food, live music, and only the BEST shaved ice from Frost Bites. Here's a grainy pic. Also, you might be thinking, why did she only get red raspberry flavor on one side? Well, that is because the other side is a CLEAR blue raspberry-whaaaat!? So you're mouth won't be blue-or my white dress. Day F O U R we spent all day on the beach because it was finally a day where you set up camp at 9:30am and stay until the tide reaches your chairs again in the evening. For dinner we celebrated our 3 year anniversary at George's at Alys Beach. I would highly recommend the Lobster Quesadilla!! We had planned to grab dessert at La Crema, but when we walked up, they said they weren't taking anymore people. It was so sad! Although they were booked, it was so beautiful walking around Rosemary. It is absolutely breathtaking. 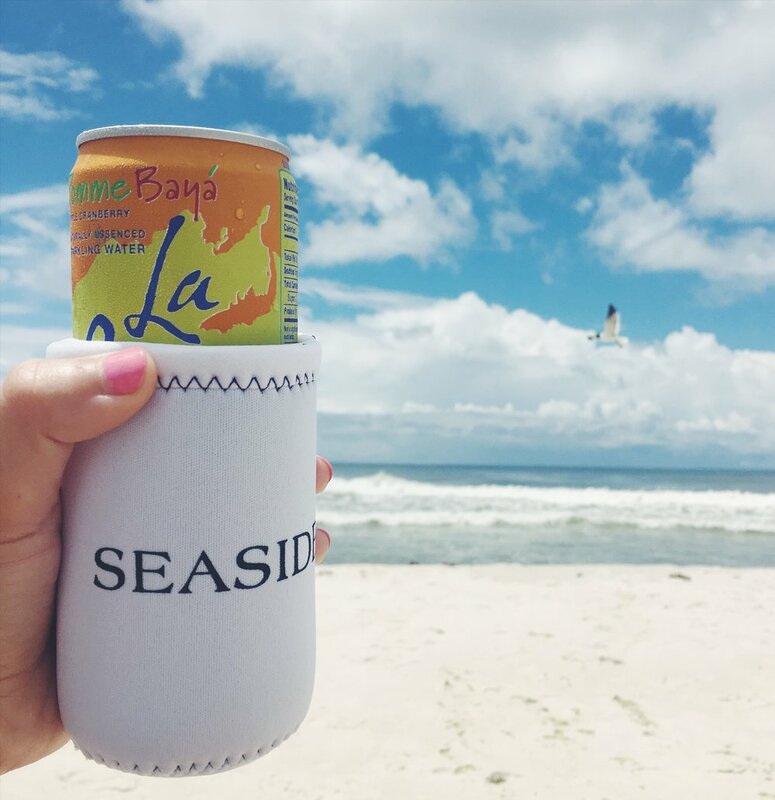 We will definitely be going there first on our next trip to 30-A. The last day of vacation always leaves a pit in my stomach, so on day F I V E, we got up and went to the beach for a couple of hours. I don't know what is worse, heading home when you wake up on the last day, or spending your last day on the beach and leaving from there. We packed up our car and headed to grab a quick bite before our 6 hour drive. Fonville Press was a place on my list we hadn't gotten to, so we headed there. I WISH we had gone there more than once. We both had the roasted chicken pressed sandwich and it was SO delicious. Also, the spot itself is AMAZING and just put the cherry on top before traveling home. He doesn't like it when I am the paparazzi, but how can I NOT?! Heres to more vacations, more adventuring, and one less metal shovel.